Fig. 1. Above Photo of the ANA Convention published in The Numismatist, Vol. XXII, Nos. 9-10, Sept-Oct (1909) : 259. William Poillon just turned 65 years old nine days earlier. Fig. 2. Photo of William Poillon taken from the above ANA 1909 Convention group photo. The identification of Poillon courtesy of the renown numismatic literature dealer David Fanning, partner in Kolbe & Fanning : Numismatic Booksellers (Since 1967). Poillon, William (1844-1918), Office : 61 Bethune Street, New York; 1st Residence : 425 West End Avenue, New York, New York; 2nd Residence : 301 West 106th Street, New York City. He was born the eldest of seven children of a Dutch family on August 1, 1844, in New York City, son of Cornelius Corson Poillon (1815-1881) and Julia Mariann Corbet (1821-). He married Clara Wilson (1851-1892), and they had three children : William Clark Poillon (1872-1947), Harry Cornelius Poillon (1874-1950), and Julia Aline Poillon (1877-). His family lineage extends back to 17th century New York beginning with Jacques Poillon (1675-1733), a Huguenot, who was born in Flatbush, Long Island, New York. The family owned large real estate holding in Brooklyn and other locations in New York and they also owned one of the largest shipyards in New York and engaged in shipbuilding. He served as a Corporal in the Fourth “D” Company, Seventh Regiment, National Guard, State of New York. In 1867, he purchased the Salamander Works, Rahway Avenue, Woodbridge, New Jersey, a clay manufactory established circa 1825. In 1871, he incorporated the pottery. The early pottery production was limited entirely to artware. In 1890, his teenage son Harry Cornelius Poillon, became the President of the Salamander Works. In 1896, a devastating fire destroyed the factory. Five years later, his daughters-in-law revived the factory in 1901. After the death of his wife Clara in 1892 and his term as ANS Vice-President he moved to Chicago embarking on a business venture, which caused him severe losses and bankruptcy. He returned to New York “a broken man” struggling through his remaining years. He died while an incumbent member of the ANS Council at his residence 301 West 106th Street, New York City, on April 12, 1918. He was involved in five auction sales of his coins, library and collectibles during his lifetime. His estate held six additional sales posthumously. He collected medals associated with the American Revolution and Masonry. His interest in medals brought him into friendship with Charles De Kay, who presented him with a copy of his 1910 book, A Brief Word on Medals. He was an ANS Life member since November 11, 1869. He was very active in the ANS and served as the Secretary 1878-1885; Vice-President 1886-1893; Historiographer 1897-1900; Curator 1906-1909. He also brought several members of his family into the ANS membership including his sons William Clark Poillon, and Harry Cornelius Poillon (AKA Cornelius), as well as other family members : John Edward Poillon, James O. Poillon, Richard H. Poillon, and Arthur Poillon. In 1875, he was a subscriber to Sylvester Sage Crosby, The Early Coins of America. In 1876, E. J. Attinelli credits him in the Preface to Numisgraphics, calling him William Poillon, Jr., probably in jest to his rather large stature. He was a donor, in 1878, to the ANS library. He also established one of the ANS Permanent Funds. From 1879 to 1880 he assisted William T. R. Marvin in the production of The Medals of the Masonic Fraternity Described and Illustrated. In 1908, he produced for the ANS, Catalogue of the Collection of Gold Coins in the Cabinet of the American Numismatic Society. This catalog, unfortunately is very brief consisting of a mere 19 pages. The paucity of text without any illustrations is explained by him in the foreword as follows : "In the preparation of this catalogue, it has been brought to the notice of the Council that the collection is lacking in many important directions, particularly in the U. S. series and Private Issues." He became a corresponding member of the Western Pennsylvania Numismatic Society in 1880. He applied to the ANA in July 1902 and is member no. 422. 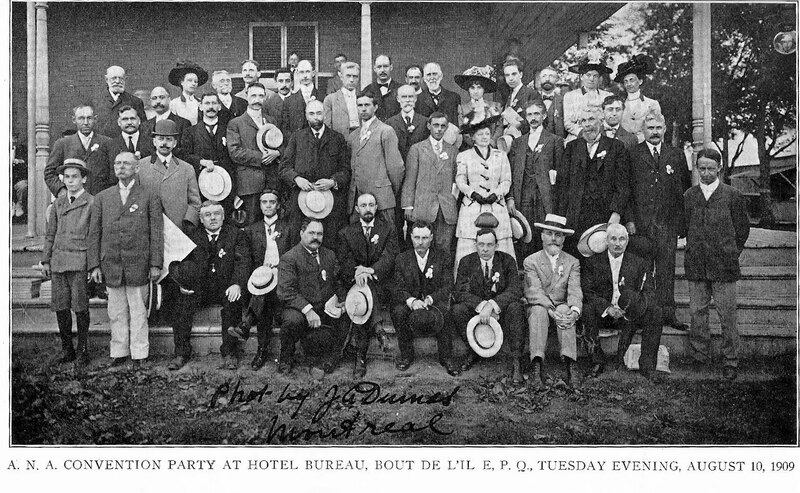 He is in a photograph taken at the ANA Montreal Convention in 1909 illustrated here in the above Fig. 1. His unbridled enthusiasm for collecting Masonic medals made him easy prey and victim to many dealers who profited from his naïve credence and numismatic ignorance in this specialized area since no guidebook or reliable reference was available to him. For example, in January 1878, he purchased the dies for the “Washington Initiation Medal, Fredericksburg, Md.” Four months earlier he had purchased a medal produced from that die from David Uri Proskey, who at that time laid claim that only six such medals existed since the dies were destroyed. Apparently, Proskey fabricated the false account of the destruction of the dies in order to inflate the value of the medal for unconscionable profiteering. Also, William Harvey Strobridge sold him a medal described as Masonic but was actually an English Guild medal. Moreover, in the Transactions of the Lodge Quatuor Coronati, 1888, on page 84 he is cited as having the largest known collection of Masonic Medals in the world. Unfortunately, this brief notice also cites an article published in Keystone Stamp and Coin Gazette, July 9, 1887, claiming that Poillon owned the oldest Masonic medal ever struck as commemorating the establishment of the Lodge at Florence in 1731 by Lord Charles Sackville. The editor of the Transactions of the Lodge Quatuor Coronati, corrected this statement saying, “that no such Lodge was ever constituted or existed, and the medal is a “pious fraud” of some thirty years later.” Despite these and other snafus in collecting Masonic medals he amassed an important and vast collection of them and Kendig says in his Keystone Stamp and Coin Gazette, July 9, 1887, that Poillon owned about 1200. Some are cited by W. T. R. Marvin and others donated to his Mason Lodge and cited in Collection Made by Committee on Antiquities of the Grand Lodge and Accepted Masons, of the State of New York (New York, 1906). See Nos. 21, 22, 362, 363, 430, 493, Addenda No. 69, 404, 405. He was a bidder in the Warner Sale held by the Chapman brothers from June 9 to 14th, 1884. He was a frequent correspondent with the Chapman brothers and made various purchases with them in small and large amounts. In 1914, he was listed in Pantheon: Adressbuch der Kunst- und Antiquitäten-Sammler und -Händler, Bibliotheken, Archive, Museen, Kunst-, Altertums- und Geschichtsvereine, Bücherliebhaber, Numismatiker, 1914 (in German) as a coin dealer who sold freemasonry medals. Poillon, William. Catalogue of the numismatic library of William Poillon. [Auction sale by Bangs & Co., Dec. 15, 1883.] Boston: T. R. Marvin & Son, 1883. 100-121 p.
Edouard Frossard, Canada coins and medals : the collection of F.J. Grenny ... part II., collection of William Poillon ... comprising United States proof sets, silver and copper coins ... and ... American medals ; foreign war medals of England, France, etc., medals of Napoleon I., a selection of silver and bronze coins of Rome ... sale by auction ... New York, James P. Silo, auctioneer, Tuesday and Wednesday October 10 and 11, 1893. Catalogue of the Library of William Poillon with Additions from Other Sources ...: To be Sold at Auction ... November 6th, 7th & 8th, 1895 by Bangs & Co. ... New York. 82 p., 1091 lots. Thomas Lindsay Elder, Public Auction Sale of The William Poillon Collection (Part IV) October 25th and 26th, 1918 by Thomas L. Elder. John Weston Adams, United States Numismatic Literature (1982, reprint 2001) Vol. 1, 71, 77, 133.